Henry S. Salt is probably not well-known today but he wrote nearly 40 books most of which cogently argued and urged for some much needed humane reforms in prisons, schools, in the economic organizations of society at large, and in the treatment of animals. He had a profound influence on Gandhi whom he introduced to Thoreau's writings via his own book on the then little known writer. Gandhi himself acknowledged the intellectual debt to Thoreau's essay on "civil disobedience" and Henry Salt in his own formulation of civil disobedience and non-violent non-cooperation. Henry Salt also was visited by and influenced people like George Bernard Shaw, William Morris, G. K. Chesterton, H.M. Hyndman, Sidney and Beatrice Webb, Ramsay MacDonald and even Havelock Ellis. 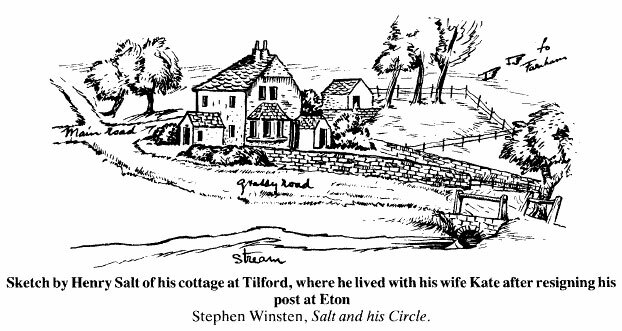 Though well-educated and destined for a lucrative career, Henry Salt choose to live a modest and very frugal life of a reform writer. He was practicing vegetarianism since he could not stomach seeing how the individual, living animal is "warped from its natural standard" to then be at our hands "scarcely more than animated beef or mutton or pork". Henry Salt is indeed an interesting turn-of-the-century writer whose ideas have been greatly influential and whose books are still worth reading. It is remarkable and hopeful how the ideas of a few thoughtful individuals can in the end wield such a large and progressive influence upon the world at large. IVU News Youth Page, March 2000 - includes a brief summary of Salt's life. A Vindication of Natural Diet (original 1813) (link to archive.org) - by Percy Bysshe Shelley (1792-1822) - 1884, with a preface by Henry S. Salt and W.E.A. Axon, 1884 edition. A Plea for Vegetarianism and other essays (PDF 2mb) - by Henry Salt, pub.1886. The one that Gandhi referred to in his autobiography - BUT... this appears to be an edited edition within a collection of essays, as it is missing some crucial lines which Salt later said were in it, see the first quote below. The first publication of the 'Plea' was almost certainly a thin paper booklet/pamphlet from 1884/5 which has not survived..
Life and writings of Henry David Thoreau (link to archive.org) by Henry S. Salt, written 1890 - 1896 edition. "The immediate object which food-reformers aim at is not so much the disuse of animal substances in general, as the abolition of flesh-meat in particular; and if they can drive their opponents to make the important admission that actual flesh-food is unnecessary, they can afford to smile at the trivial retort that animal substance is still used in eggs and milk. . . . They are well aware that even dairy produce is quite unnecessary, and will doubtless be dispensed with altogether under a more natural system of diet." - from The Humanities of Diet. Manchester: The Vegetarian Society, 1914 - where Salt stated "I quote the following from my 'Plea for Vegetarianism,' published nearly thirty years ago" - in which case the edition of the 'Plea' we have above must have been edited as we cannot find it in there. However it would be significant as that was the first vegetarian article that Gandhi read. "I launched out in search of a vegetarian restaurant [in London 1887], I would trot ten or twelve miles each day. go into a cheap restaurant and eat my fill of bread, but would never be satisfied. During these wanderings I once hit a vegetarian restaurant in Farringdon Street. The sight of it filled me with the same joy that a child feels on getting a thing after its own heart. Before I entered I noticed books for sale exhibited under a glass window near the door. I saw among them Salt's Plea for Vegetarianism. This I purchased for a shilling and went straight to the dining room. This was my first hearty meal since my arrival in England. . . . From the date of reading this book, I may claim to have become a vegetarian by choice. I blessed the day on which I had taken the vow hefore my mother. I had all along abstained from meat in the interests of truth and of the vow I had taken, but had wished at the same time that every Indian should be a meat-eater, and had looked forward to being one myself freely and openly some day, and to enlisting others in the cause. The choice was now made in favour of vegetarianism, the spread of which henceforward became my mission." when I received the invitation to be present at this meeting, I need not tell you how pleased I was because it revived old memories and recollections of pleasant friendships formed with vegetarians. I feel especially honoured to find on my right, Mr. Henry Salt. It was Mr. Salt�s book � A Plea for Vegetarianism�, which showed me why apart from a hereditary habit, and apart from my adherence to a vow administered to me by my mother, it was right to be a vegetarian. He showed me why it was a moral duty incumbent on vegetarians not to live upon fellow-animals. It is, therefore, a matter of additional pleasure to me that I find Mr. Salt in our midst.